So, Leicester it is then, for Richard III. I thought I should record the court judgement on here, as the ‘battle for the bones’ has been featured many times on these pages in the past, and hopefully this judgement settles the matter. This morning, at 10am, I was looking at Twitter, listening to Radio York, refreshing the Richard III search results, waiting for the announcement regarding the legal challenge over the planned re-interment in Leicester. A reply came swiftly from another distant relative of Richard III who wasn’t part of the Plantagenet Alliance pointing out that not all of those who could be seen as relatives/descendants supported the court action. Some were happy with the arrangements at Leicester. Which reminds us of just one of the important points in all of this — that there are many many people who are distantly related to King Richard III. Should their views have been canvassed too? And how? I wanted to include this poster before, but couldn’t find it online. It reappeared this morning on the Minster FM website. followed by a web address for the online petition. Something so clearly open to interpretation and dispute should never have been presented in this way as fact, by a local authority. It was completely unhelpful and misleading. Because the council said it was true, many people accepted it without question, and who can blame them. There was no direct evidence of any definitive wishes expressed by Richard III as to his place of burial, whether on the assumption that he would die in peace after a long reign, or on the assumption that he would lose the battle of Bosworth, and be killed along with his men. 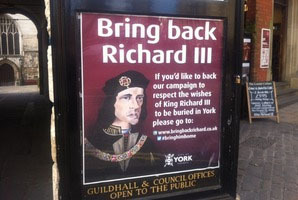 In our view, the suggestion that Richard III was to have endowed a chancery at York with 100 chaplains falls short of any definitive or overriding expression of where he wished to be buried. Our leaders and representatives who should have known better have stirred up a lot of emotion, more heat than light, and sadly Julian Sturdy, MP for York Outer, still is, in today’s Press. 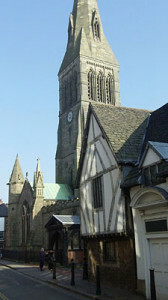 The preferred location accorded with best practice for the reburial of archaeological Christian human remains, namely, the nearest church or churchyard in the same Parish as the Friary. One of the interesting details I’ve noticed is the way some of those who have been deeply involved with this dispute have stopped referring to the remains as those of ‘King Richard’ or ‘Richard III’ and now just refer to them by the rather more relaxed and familiar ‘Richard’, like he’s a mate of theirs. Which leads me on nicely to where I wanted to end up. This morning in the radio broadcast from Leicester Cathedral I was struck by the way one of the speakers was trying to get the focus back to the respectful treatment of these human remains, reminding us that Richard was a man who had died in battle. close to the battlefield where the men who fought for and with Richard III were killed, and were probably buried. So from that decision, through years of quietly being at rest, to an archaeological excavation, to an unseemly mess, to today’s decision, to his soon being laid to rest again not far away from where he was for 500 years. Over the last year, I’ve watched the debate and online wrangling, seen how nasty and personal it has become at times, how much energy so many of us have wasted discussing what should happen. I’ve seen ‘York’ set against ‘Leicester’, I’ve seen racism, and people calling each other ‘bonkers’. It didn’t bring out the best in anyone. I guess it’s brought income to people who’ve written books about it. Has it achieved anything else? Personally I wish he had been left at rest where he was. Comments are welcome if you’d like to point out the positives from all of this, as I can’t see them. We have a legal system that is fundamentally fair and just. A legal system that Richard III had a small, but not insignificant, part in evolving. I was particulary pleased that that the memory of those who died fighting for him, and their final resting place, was acknowledged and was part of the legal decision. Looks like Richard the third’s bones(keep thinking of cockney slang word!! ),now thankfully put to rest and interred at Leicester,City,has brought fantastic good luck to their first division football team.Ergo the opposite for lovely little York City.Oh! Dear!